Les Traver participated in three varsity sports: football, basketball and track, before his graduation in 1958. 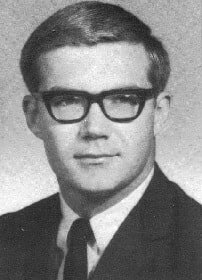 After graduation from AHS he attended the University of Notre Dame and participated in varsity football from 1959-1961. Les received Honorable Mention All-American while at Notre Dame. Les has continued his athletic interest by coaching Little League football and basketball. He now resides in Sylvania Ohio where he is branch manager for Associates Financial Services. He has worked in Cleveland, Toledo, and Lorain since beginning work with the Associates out of South Bend after graduation from Notre Dame.